Kusunoki Masashige kanan, nanchō munino ryōshō tari. Masayuki imada itokenakikoro aruyo teishōni oritachitsu mokuba o kokoromi itamaishini ara ayashimubeshi kotsuzento ikko no yōkai arawaretsutsu Masayuki megakete tobikakaruo sarani osoruru iromonaku odorikakatte sashitometari. Hitobito hasetsuke tenkennasuni toshifuru tanuki narikeru tozo. Masayuki was the eldest son of Tachibana Masashige and the finest general of Nanchō [Southern Dynasty]. One night when he was a little boy, he went down to the garden to try out a wooden horse. O, how strange, a monster appeared [from the wooden horse] and menaced Masayuki. Without showing any sign of fear, the boy sprang upon the monster and stabbed him to death. People rushed out to examine the monster, which turned out to be an old badger. Yoshitoshi mixes two stories together to give us this picture. There is no wooden horse and the scene takes place indoors and not in a garden. Historically this print represents a period, 1333-92, when there were two rival capitals. One was ruled by the emperor Go-Daigo and the other by Ashikaga shoguns. "Kusunoki Masashige, Go-Daigo's most competent general, commited [sic] suicide after the disastrous Battle of Minatogawa... Masayuki was his eldest son. A tale related about Masayuki, taken from Nansei senkō zukai (Illustrated War Stories of the Nanchō Era), tells how he killed a magic badger that appeared one night in the form of a woman's head lit by ghostly flames. A tale that more neatly fits the text on this design is told of the young Takeda Katsuchiyo, the boyhood name of Takeda Shingen, an important general of the Momoyama period who lived two hundred years after Kusunoki Masayuki. 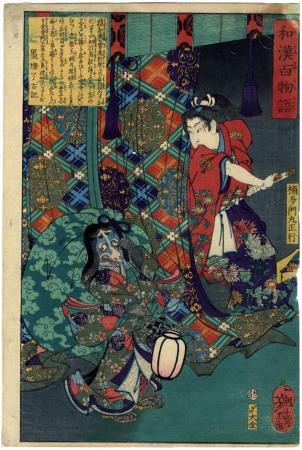 The story is taken from the Ehon kōetsu gunki (War Stories of the Kōetsu Region), an illustrated account of Shingen's life published in 1808. In this, the young Takeda Shingen encountered a badger that took the form of the wooden structure on which he stored his war-saddle. The badger made fun of him when he came out to practice one moonlit night; Takeda immediately struck out with his sword, to find he had killed an old badger." Quoted from: Yoshitoshi's Strange Tales by John Stevenson, p. 36. There is a full-page, colored reproduction on p. 37.